Pizza history is very interesting. The actual word “pizza” was first documented in 997 AD in Gaeta, Italy, and successively in different parts of Central and South Italy. While pizza has been eaten in Italy for centuries, it was not until after World War II and when pizza became popular in America, that it became really popular in Italy. In one of its many forms, pizza has been a basic part of the Italian diet since the Stone Age. This earliest form of pizza was a crude bread that was baked beneath the stones of the fire. After cooking, it was seasoned with a variety of different toppings and used instead of plates and utensils to sop up broth or gravies. It is said that the idea of using bread as a plate came from the Greeks who ate flat round bread (plankuntos) baked with an assortment of toppings . It was eaten by the working man and his family because it was a thrifty and convenient food. The pizza actually could have been invented by the Phoenicians, the Greeks, Romans, or anyone who learned the secret of mixing flour with water and heating it on a hot stone. Lots of easy-to-make and delicious Pizza and Pizza Dough Recipes. 79 A.D. – In the ashes after Mount Versuvius erupted and smothered Pompeii on August 24, 79 A.D., evidence was found of a flat flour cake that was baked and widely eaten at that time in Pompeii and nearby Neopolis, the Greek colony that became Naples. Evidence was also found in Pompeii of shops, complete with marble slabs and other tools of the trade, which resemble the conventional pizzeria. The Museo Nazionale at Naples exhibits a statue from Pompeii which because of its stance is called I pizzaiolo. 1522 – Tomatoes were brought back to Europe from the New World (Peru). Originally they were thought to be poisonous, but later the poorer people of Naples added the new tomatoes to their yeast dough and created the first simple pizza, as we know it. They usually had only flour, olive oil, lard, cheese, and herbs with which to feed their families. All of Italy proclaimed the Neapolitan pies to be the best. At that time, the Tavern of the Cerrigloi was a hangout for the Spanish soldiers of the Viceroy. It is said that they flocked there to feast on the specialty of the house – pizza. King of Naples, Ferdinando IV (1751-1821), in his summer palace of Capodimote, allowed his cook to bake a few pizzas in the ovens which his father, Charles II, had his famous porcelains fired. Pizza had become a favorite dish of the Ferdindo’s wife, Queen Maria Carolina d’Asburgo Lorena (1752-1814). 1889 – Umberto I (1844-1900), King of Italy, and his wife, Queen Margherita di Savoia (1851-1926), in Naples on holiday, called to their palace the most popular of the pizzaioli (pizza chef), Raffaele Esposito, to taste his specialties. Raffaele and his wife, Maria Giovanna Brandi, prepared three different kinds of pizzas: one with pork fat, cheese, and basil; one with garlic, oil, and tomatoes; and another with mozzarella, basil, and tomatoes (in the colors of the Italian flag). The Queen liked the last kind of pizza so much that she sent to the pizzzaiolo a letter to thank him. This official document, dated June 1889, and signed Galli Camillo, head of the table of the Royal Household, can be seen in the rooms of the restaurant today. Raffaele Esposito dedicated this pizza to the Queen and called it “Pizza Margherita.” This pizza set the standard by which today’s pizza evolved as well as firmly established Naples as the pizza capitol of the world. In the book, Fine di un Regno, by Raffaele De Cesare and published in 1895, cites that the Pizzeria di “Pietro” had already been operating for more than a century. This evidence is further strengthened in the book La Neapolitan pizza by Gabriele Benincasa claims that the pizzeria is older based on the fact that the first owner was probably not the famous Pietro il Pizzaiolo (in that century Pietro Calicchio) but his father Giovanni who had been in business already in 1760. This restaurant still exists today and is still being run by the family. For many people, especially among the Italian-American population, the first American pizzas were known as Tomato Pie. Even in the present 21st century, present-day tomato pie is most commonly found in the Northeastern United States, especially in Italian bakeries in central New York. Tomato pies are built the opposite of pizza pies – first the cheese, then the toppings, and then the sauce. 1905 – Gennaro Lombardi is credited to having opened the first United States Pizzeria in New York City at 53 1/2 Spring Street (now know as Little Italy). Lombardo is now known as America’s “Patriaca della Pizza.” It wasn’t until the early 1930s that he added tables and chairs and sold spaghetti as well. In 1895 Gennaro Lombardi, at the age of 14 and already a bread maker by trade, emigrated from Naples, Italy, and came to New York where he made pizza in a bakery/grocery store on Mulberry Street, using the same dough recipe his father and grandfather had used in Naples. In 1905, the owner of the bakery/grocery store offered to sell the store to young Gennaro, who jumped at the chance. Within a few years, he realized that while bread and groceries were business, the future was made of pizza. Lombardi wanted to have a real American pizza business, and so acquired that first pizza-selling license for his location at 53 1/2 Spring Street. A downturn in the economy forced it to close its doors in 1984. In 1994, ten years after Lombardi’s had closed, John Brescio and Jerry Lombardi decided to revive Lombardi’s. They were soon joined by Andrew Bellucci, a chef-turned-pizza fanatic who had worked and trained at making pizzas in two other restaurants. 1910 – Joe’s Tomato Pies was opened in 1910 and is regarded as the second pizzeria established in America after Lombardi’s (see above). 1943 – A pizza with a flaky crust that rises an inch or more above the plate and surrounds deep piles of toppings. It is said that this pizza was created by Ike Sewell at his bar and grill called Pizzeria Uno. 1945 – With the stationing of American soldiers in Italy during World War II (1941-1945) came a growing appreciation of pizza. When the soldiers returned from war, they brought with them a taste for pizza. 1948 – The first commercial pizza-pie mix, “Roman Pizza Mix,” was produced in Worcester, Massachusetts by Frank A. Fiorello. 1950s – It was not until the 1950s that Americans really started noticing pizza. Celebrities of Italian origin, such as Jerry Colonna, Frank Sinatra, Jimmy Durante, and baseball star Joe DiMaggio all devoured pizzas. It is also said that the line from the song by famous singer, Dean Martin; “When the moon hits your eye like a big pizza pie, that amore” set America singing and eating pizzas. 1957 – Frozen pizzas were introduced and found in local grocery stores. The first was marketed by the Celentano Brothers. Pizza soon became the most popular of all frozen food. December 9, 2009 – The European Union established a ruling to protect Naples’ Neapolitan pizzas. The EU’s ruling said Neapolitan pizza was now part of Europe’s food heritage, and that all pizzerias aspiring to supply and make the real Neapolitan pizzas must comply to strict traditional standards regarding ingredients and preparation that include using only San Marzano tomatoes and fresh buffalo mozzarella cheese. This protect status will enable producers to not only boast about their exclusivity, but also charge a premium for the pizza. Culinaria – The United States, A Culinary Discovery, by Randi Danforth, Peter Feierabend, and Gary Chassman, published by Konemann Publishing, 1998. Goldberg’s Pizza Book, by Larry Goldberg, published by Random House, 1971. Let Eat – The History of Pizza, by Mani Niall, an internet web site. 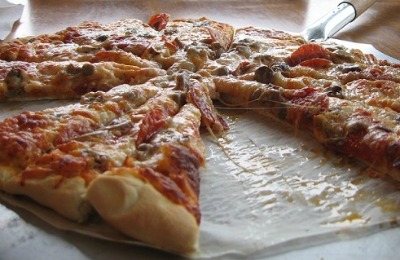 Lombardi’s Pizza Restaurant, Interesting America.com, by Caitlin Doherty (January 12, 2011). New Jersey Monthly, The Original, January 12, 2010. Virgil’s Aeneid, translated by John Dryden, published by Penguin Classics, 1997. The Complete Book of Pizza, by Louise Love, published by Sassafras Press, 1980. The History of Pizza, an internet web site. The History of the Pizza Margherita, an internet web site. The Food Chronology, by James Trager, published by Henry Holt and Company, 1995. The Pizza Express Cookbook, by Peter Boizot, published by Elm Tree Books, 1976. The Roman Cookery Book, a critical translation of The Art of Cooking by Apicius, translated by Barbara Flower and Elizabeth rosenbaum, published by Harrap, 1958. The Wonderful World of Pizzas, Quiches, and Savory Pies, by Anna Ceresa Callen, published by Crown Publishers, Inc., 1981. You could certainly see your expertise in the article you write. The arena hopes for more passionate writers such as you who are not afraid to mention how they believe. Wow! I think your 21st century fact about the European Union protecting Naples’ Neapolitan pizzas is very interesting. I loved reading through the history of pizza and how it grew in the United States during the 20th century. I had no clue that frozen pizzas were a thing back in 1957. I never knew that Pompeii may have had pizzerias! Ever since kindergarten, I have been under the impression that pizza was something created around the time Marco Polo returned from his trip. I love making all types of pizza. It’s interesting to know that people have been enjoying it for centuries.